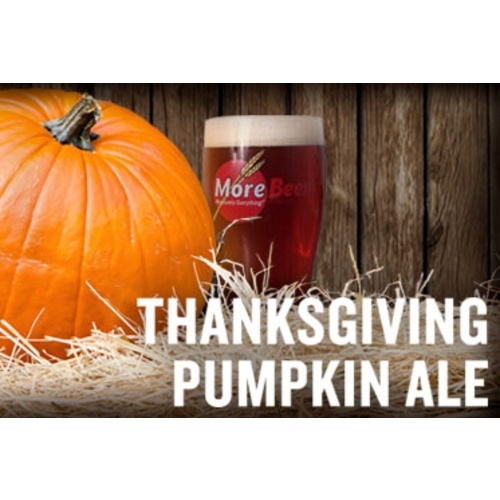 Also referred to as a pumpkin beer recipe, our famous Thanksgiving Ale is based on an Amber Ale with modest bittering, a mild hop finish, and of course the subtle flavor of pumpkin spice. Not overpowering in the spice, it is a great beer to share with both experienced and novice beer lovers. Show up at Thanksgiving with a case of your own pumpkin spiced beer and your in-laws may just change their mind about you... normally you can't buy that kind of love. Looked interesting and decent reviews. My family and friends like this kit and its a good seasonal one since we love fall in New England! Brewed last year, excellent kit! Wonderfull brew. One of my best yet, and everyone continues to ask for more. Decent light ale with subtle pumpkin flavor, made per recipe kit. Next year I'll try it again with more pumpkin spice. While I was excited to finally brew my own beer for the first time, I did some research, asked a lot of questions, and put a plan together. I used 3 - 15oz cans of organic pumpkin and fresh ground pumpkin pie spices rather than the ones included in the package. I'm not sure what the organic pumpkin did other than give the beer a slight creamy taste adding to the body of the beer, otherwise there is no pumpkin flavor at all. I also used S-05 yeast, and it was fermented in a stainless steel fermenter at 68?_F. The spices come through nicely, but next time I will use a tablespoon in place of the two teaspoons it called for. While the beer is drinkable for sure, its mediocre at best. That being said, it may be I'm just not pleased with the flavor expecting more from the pumpkin but I will do this one again for sure. Worth waiting in a pumpkin patch for! This really is the Great Pumpkin! I'm not so much a fan of beers using pureed pumpkin, but do like the pumpkin spice in just about anything and this nice ale is just dandy! I made a batch for Thanksgiving as we were hosting about 30 family members and it was a big hit! I called it "Bumpkin Pumpkin's Turkey Day Ale" Will be doing this one again next year! I added 6 lbs. of roasted pie pumpkins from a local pumpkin patch; I now have a new favorite beer on tap. 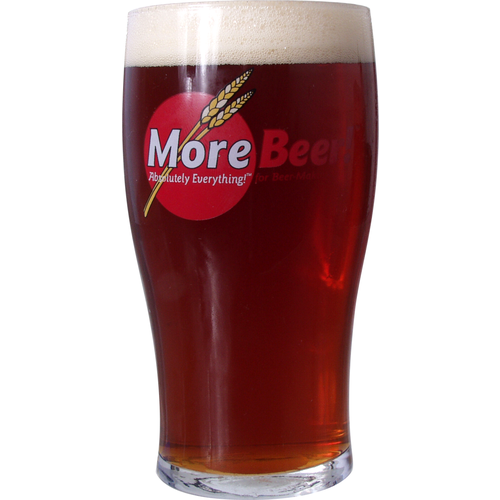 I tasted a little bit of the wort.. and its far more impressive than what I have brewed via online recipes. Thumbs up and cant wait until this is ready! You guys have outdone yourselves with this one! I also tried an all grain batch via the recipe provided, and added some cinnamon. Cant wait!!! I just open one of my pumpkin beers, and it's sooooooooo good! I made it just like the kit called for, but I added one tablespoon of pumpkin spice I got from my local grocery store and I added 2, 15oz cans of Libby's 100% pure pumpkin into the last 15 min. of my boil. I also pitched one pack of S0-5 dry yeast in my primary. I let it set in my primary for 10 days at 68 degrees and then I racked it to my secondary and let that set for another 14 days before I bottled it. All the pumpkin pure sank out to the bottom of my yeast cake, so when I did bottled my beer, it was nice and clear. I let the bottles set under my stairs for 2 weeks before I put some in my refrigerator. If you like pumpkin pie, you will Love this beer! It just keeps getting better and better the longer I let it set in my refrigerator. what type of yeast did u use??? 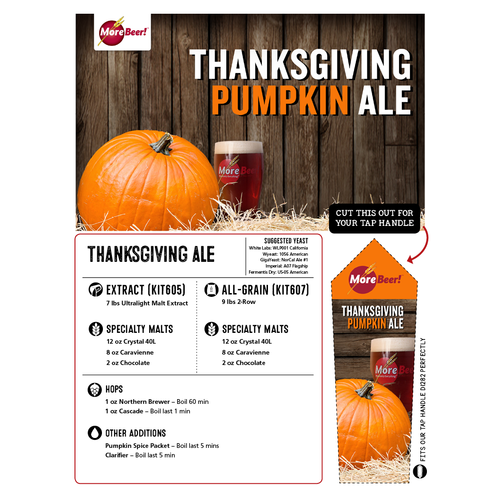 If your a fan of a nice easy drinking pumpkin this is the one for you. I added an extra oz of German Opal hops, then a little extra nutmeg and cinnamon to give it a good bite. This year i may add some real pumpkin to make it authentic. One of my favorites. I try and make a point to have this ready to go for the Holidays almost every year. I like the subtleness of the pumpkin flavor...not over powering but, just enough to let you know you're drinking something unique. I added another tablespoon of Pumpkin spice and two tablespoon of cinnamon to my boil at the last 5 minuets. I have been told by family and friends that they love this beer. Next time I think I will be adding another pound or two of DME to give it more of a kick. which yeast did you use? I used one pack of SO 5 dry yeast. This kit after brewing is a tasty kit, Very year I buy about 3 kit. I have gaven to friends and they all want more.